EXCAVATORS NOVEMBER 2017 • E&MJ 41 www.e-mj.com barge-shipping to the port at Seward, then breaking it down into parts for onward deliv- ery by truck. Re-assembly at the mine took just three days, with the machine being re- commissioned in mid-2015. Alterations for use at the mine included the addition of a fire-suppression system and a winterization package, while the exist- ing bucket was switched to one with pointed teeth that was better able to handle coal dig- ging. The EX1900-6 is now matched with a fleet of Cat 785, 150 st-capacity haulers. Across the other side of North Amer- ica, Hitachi has also reported on one of its larger EX5600-6 excavators that has been working at the Canadian Malartic open-pit mine in northwestern Québec since being commissioned there mid-last year. Now owned by a joint venture be- tween Agnico Eagle Mines and Yamana Gold, Canadian Malartic has a nameplate capacity to produce 600,000 oz/y of gold from resources overlying old workings that themselves produced 8.7 million oz during the period from 1935 to 1983. And the presence of the old workings is one of the factors that spurred the mine's management into buying the new excava- tor, according to Hitachi. "The open pit is right above underground mines, so there are many cavities we need to work around," said Éric Lecomte, Canadian Malartic's mine operations director. "As a result, we operate machines remotely in those areas – it's really a matter of health and safety. We had a smaller, diesel shovel that was operated remotely, but we wanted to im- prove production, so we decided to add the Hitachi machine to enhance productivity." At the corporate level, early last year, Hitachi introduced electric versions of five of its mining shovels for the North- and Latin-American markets. All five are available with the company's SkyAngle system, which gives the operator better peripheral vision of ground-level obstacles around the excavator on a single monitor. 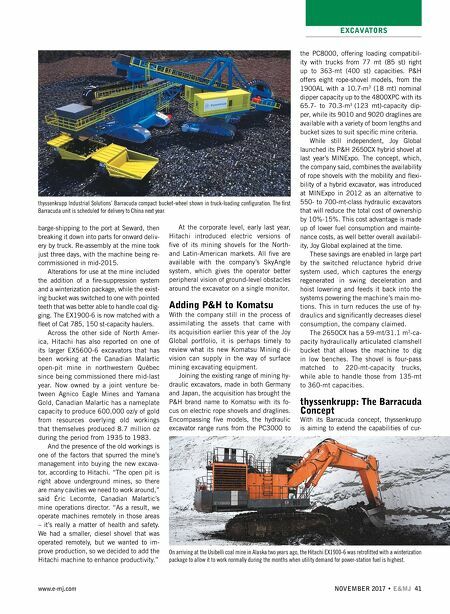 Adding P&H to Komatsu With the company still in the process of assimilating the assets that came with its acquisition earlier this year of the Joy Global portfolio, it is perhaps timely to review what its new Komatsu Mining di- vision can supply in the way of surface mining excavating equipment. Joining the existing range of mining hy- draulic excavators, made in both Germany and Japan, the acquisition has brought the P&H brand name to Komatsu with its fo- cus on electric rope shovels and draglines. Encompassing five models, the hydraulic excavator range runs from the PC3000 to the PC8000, offering loading compatibil- ity with trucks from 77 mt (85 st) right up to 363-mt (400 st) capacities. P&H offers eight rope-shovel models, from the 1900AL with a 10.7-m 3 (18 mt) nominal dipper capacity up to the 4800XPC with its 65.7- to 70.3-m 3 (123 mt)-capacity dip- per, while its 9010 and 9020 draglines are available with a variety of boom lengths and bucket sizes to suit specific mine criteria. While still independent, Joy Global launched its P&H 2650CX hybrid shovel at last year's MINExpo. The concept, which, the company said, combines the availability of rope shovels with the mobility and flexi- bility of a hybrid excavator, was introduced at MINExpo in 2012 as an alternative to 550- to 700-mt-class hydraulic excavators that will reduce the total cost of ownership by 10%-15%. This cost advantage is made up of lower fuel consumption and mainte- nance costs, as well better overall availabil- ity, Joy Global explained at the time. These savings are enabled in large part by the switched reluctance hybrid drive system used, which captures the energy regenerated in swing deceleration and hoist lowering and feeds it back into the systems powering the machine's main mo- tions. This in turn reduces the use of hy- draulics and significantly decreases diesel consumption, the company claimed. The 2650CX has a 59-mt/31.1 m 3 -ca- pacity hydraulically articulated clamshell bucket that allows the machine to dig in low benches. The shovel is four-pass matched to 220-mt-capacity trucks, while able to handle those from 135-mt to 360-mt capacities. thyssenkrupp: The Barracuda Concept With its Barracuda concept, thyssenkrupp is aiming to extend the capabilities of cur- thyssenkrupp Industrial Solutions' Barracuda compact bucket-wheel shown in truck-loading configuration. The first Barracuda unit is scheduled for delivery to China next year. 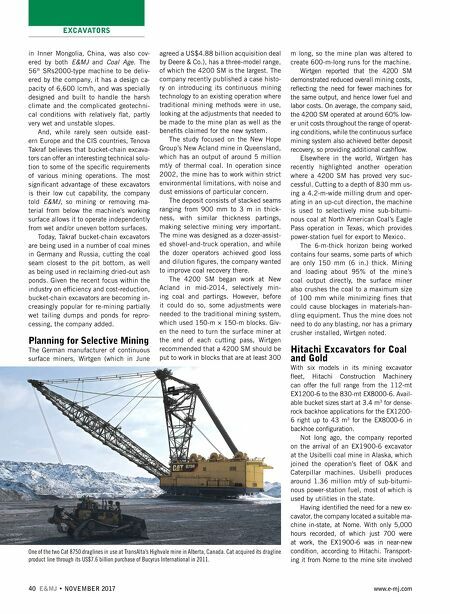 On arriving at the Usibelli coal mine in Alaska two years ago, the Hitachi EX1900-6 was retrofitted with a winterization package to allow it to work normally during the months when utility demand for power-station fuel is highest.